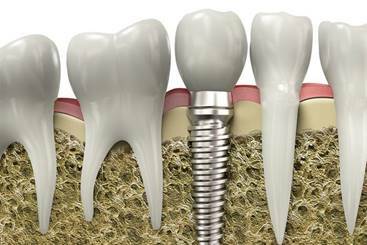 Dental implants are used to safely replace missing or damaged teeth. Dental implants are the basis for dental prosthesis which function and look just like natural teeth. Our dentists specialize in dental implants in Romania and can offer you high quality services at the most affordable prices. A dental implant is a complex procedure and the patient needs to follow certain steps in order for the procedure to be successful. During the first meeting with our dentist you will receive a detailed consultation and the dentist will make a diagnosis based on your medical history. The dentist will also establish a comprehensive dental treatment plan for you to follow during the following months. Implant dentistry requires careful planning, experience in dental surgery and tooth restoration. Needless to say, dental implants are a small work of art and only dentists, like our team in Romania, can work with the necessary finesse in order to meet the patient's high expectations. 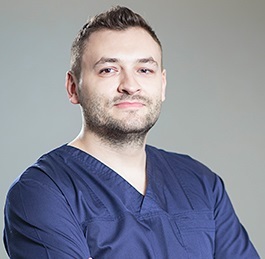 Our specialist in implantology, dr. Adin Talasman explained the steps of the procedure in an interview with DentalImplantCostGuide.com one of the online leading ressource on dental tourism worldwide. Modern dental implants are based on the osseointegration process, during which certain materials, like titanium, fuse to the jawbone. Titanium and titanium alloys are the most commonly used metals in dental and bone implants and they have the highest success rate out of any implanted surgical devices. The period needed for the implant to fuse to the bone can take anywhere between 3 to 12 months, according to the patient’s health. Our Romanian dentists work with the best materials to ensure that there are no compatibility problems. The first step is to fix an implant abutment with an abutment screw (the titanium portion of the tooth that acts as the new root). A crown (dental prosthesis or false tooth) is then attached to the abutment usually using dental cement or a small screw. Dental implants are the basis for prosthetics that can be fixed or removable. Also, dental implants can be used to replace a single tooth or to replace multiple teeth. Please do not hesitate to contact our Romania dentists if you are interested in this area of dentistry. Are dental implants the right choice for any patient? Modern technology allows us to perform successful dental implants even in the most difficult cases where patients have had old dental extractions and where the quality of the bone structure wouldn’t usually allow for a successful fusion. Although dental implants are usually requested by patients over 40 years of age, this procedure can also be performed on younger people (if no medical contraindications exist). Teenagers who suffer from dental agenesis (missing teeth due to a genetic cause) or who have lost teeth can also be candidates for dental implants after the age of 18 when their physical development is considered complete. Dental implants are durable and they may not need to be replaced for 20 or 25 years. However, maintenance is very important and the patient has to work closely with the dentist in order to preserve the dental implant. Oral hygiene is extremely important and so are regular check-ups with the dentist. Our dentists in Romania can offer you specialised advice for preventing dental problems. 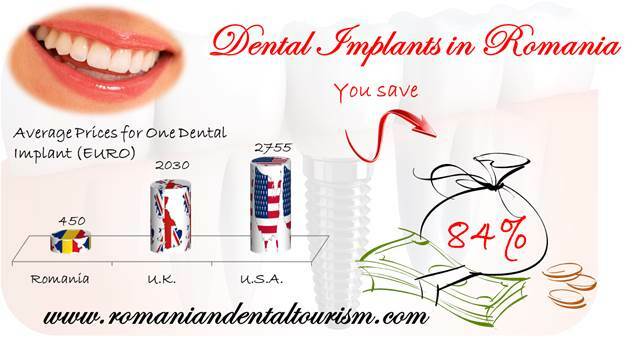 If you are interested in dental implants in Romania, our team of professional dentists can help you make an appointment and find the best dental tourism package for your needs. We are here to provide you with any other information about various dental treatments in Romania, such as root canal procedures.